From a very young age I have been interested in Tudor England. I have always been fascinated with Elizabeth I and how the decisions that were made by those before her affected the way Elizabeth ruled her country and the person she became. It was a real life soap opera filled with love, lust, and murder; hard to believe it was real but it was. 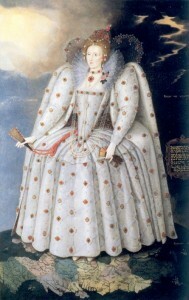 Elizabeth was born with one flaw, she was born a female to a king who was obsessed with having a male heir. Elizabeth lost her mother at 2 1/2 years old. I cannot imagine the confusion and lonliness Elizabeth felt as a small child being brushed aside by her father and then losing her mother at such a young age. The ever changing mother figure in and out of her life with each passing queen had to be a lot for a young girl to grasp. You would think this would have hardened her towards her father or her loss in life would have angered her but Elizabeth was a gentle child who loved and cared for others around her. Elizabeth had a great respect for her father and did everything she could to earn her father’s love and approval as seen in the poetry and songs she wrote him. I believe that even though Elizabeth never really knew her mother, how her mother was treated by the men in her life and Elizabeth’s own life lessons had a great affect on her decision to remain the “Virgin Queen” for the forty-four years of her reign and never marry. Elizabeth, though she loved men and their attentions, never wanted to be under the control or ambitions of any man. She knew that man’s lusts and declarations of everlasting love were ever changing and she would never put herself in the position of being tossed aside. Elizabeth had several marriage proposals and men professing their undying love but something always held her back and a more level head prevailed. Elizabeth made her decisions based on her head not her heart she knew that a man would try to take her power as his own. She knew that every decision she made would affect not only her but her people. She was an intelligent woman she knew how to survive scandal, she knew how close she had come to not surviving to become queen. She knew the stories of her father’s ever-roaming eye and the hateful things said of her mother and I believe decided at a very young age not to repeat their fates. Elizabeth’s father, Henry VIII obsessed his whole live about having a male heir that could carry on his legacy. He fought so hard to keep his daughters from ruling after his death, especially the daughter of the woman whom he hated even after her death. Wouldn’t he be shocked if he knew that in a way all of his scheming and obsession for a male heir failed and his youngest daughter was one of the longest and most influential women rulers England has ever known.